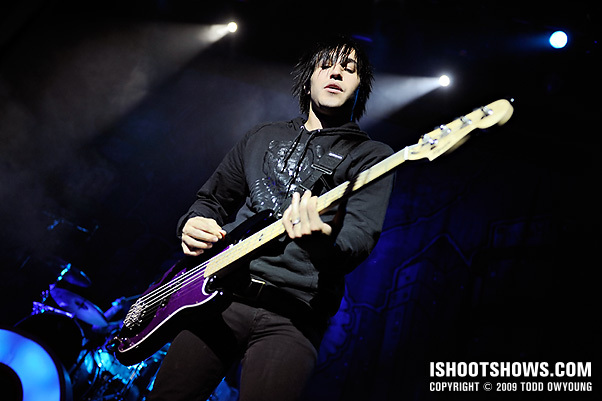 Performing on a one-off concert for the (RED)Nights concert series, Fueled By Ramen's Fallout Boy took a break from opening for Blink-182 to rock a 2,000-strong crowd in an intimate club performance at the Pageant. Despite 2 spotlights up in the balcony, this was a strange concert to photograph. While the band brought some of their own lights, the setup was surprisingly spartan, with the high-contrast spotlights doing much of the work for the stage treatment and only the barest background effects. 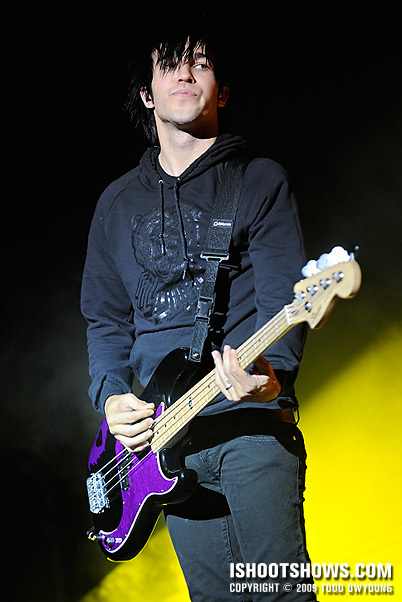 Still, the chance to photograph Fallout Boy was one that had me eager to see what the four-piece could do, fresh off their arena-bursting tour of the States earlier this summer. 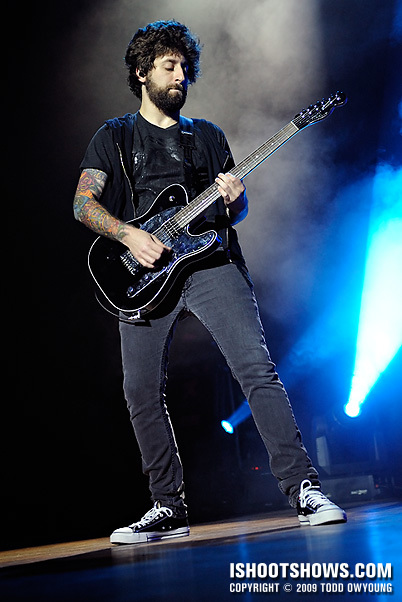 For me, the most active performers for this gig were singer and guitarist Patrick Stump and lead guitarist Joe Trohman, who rocked out at the front of the stage. 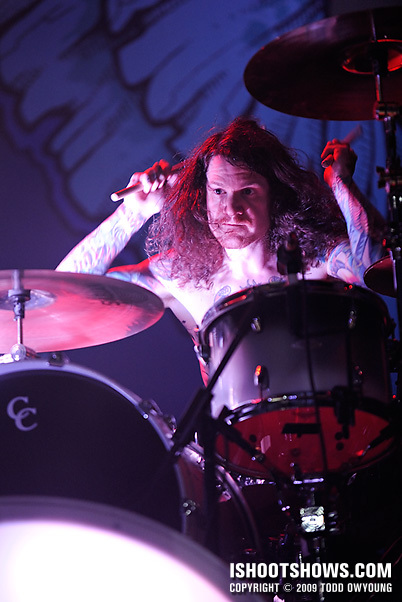 Of course, drummer Andy Hurley was wailing away on the drums, but a deficit of clean lighting made shooting all the more difficult. 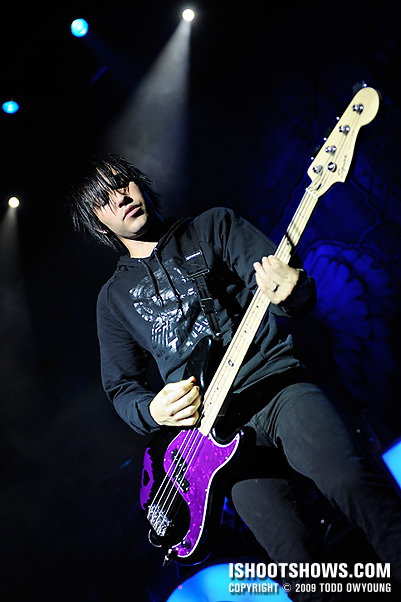 Pete Wentz played it cool for the most part in his time at the front of the stage, rocking out sparely and allowing himself a few spin-kicks with the bass. While two-songs were specified from the outset, security allowed press three for this show – I'm not sure whether this was due to a mis-communication or a change in the rules by the tour. For this gig, I relied on the Nikon 24-70mm f/2.8 for much of the shooting, switching occasionally to the Nikon 70-200mm f/2.8 and 14-24mm f/2.8 for the one-off shot here and there. The band was setup with their mics very close to the stage, so angles were a constant concern along with the shadows cast from the spotlights. Thanks for the comment. 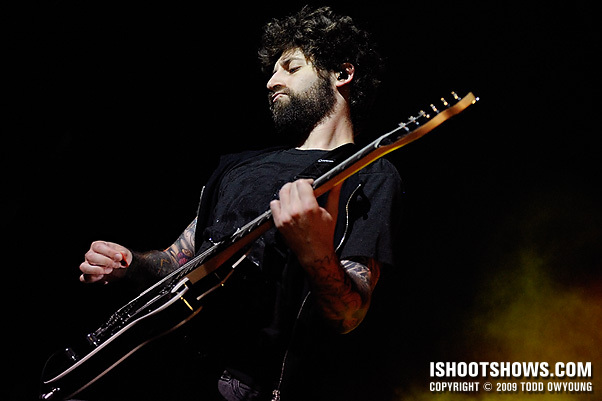 The band rocked out in their own way – I’d heard that Fallout Boy play it cool while playing without a lot of movement, but they all definitely had their moments. Hey Todd, long time reader first time poster from the UK here! 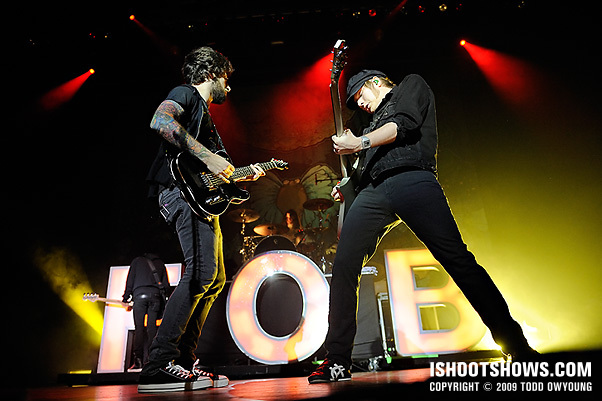 These are really great shots of FOB, it must have been great to get fairly close to such a big group. 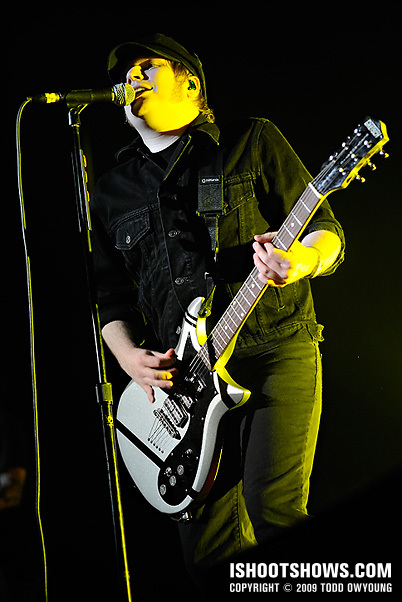 I shot them last year when they played some arenas in the UK, my pics are nowehere near as good as yours, but hopefully they’ll get better once I can afford a faster telephoto (I currently use an f/4-5.6 70-300 Sigma for arenas). 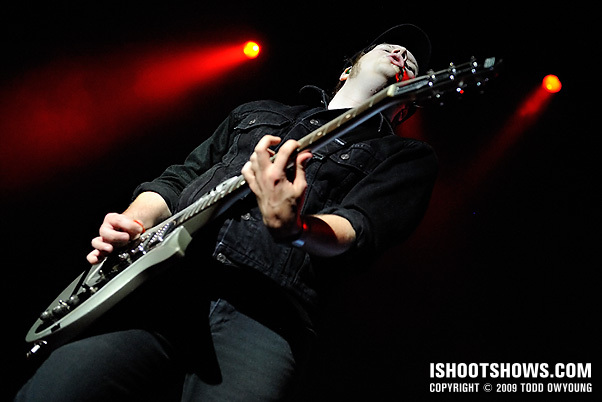 Anyway, you can see my efforts here http://davemussonphotography.wordpress.com/2008/10/20/thnks-fr-th-pcs-fall-out-boy-in-birmingham/ thanks for sharing your great work! Thanks for dropping by to comment, always love to hear from long-time readers. 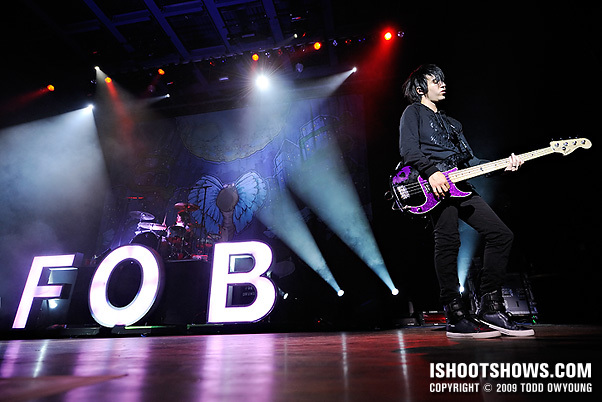 I should be having another go at FOB shortly, as they’re opening for Blink-182 here at the end of the month. It looks like you got some nice color backgrounds (or washes on the backdrop) and made good use of those moments. 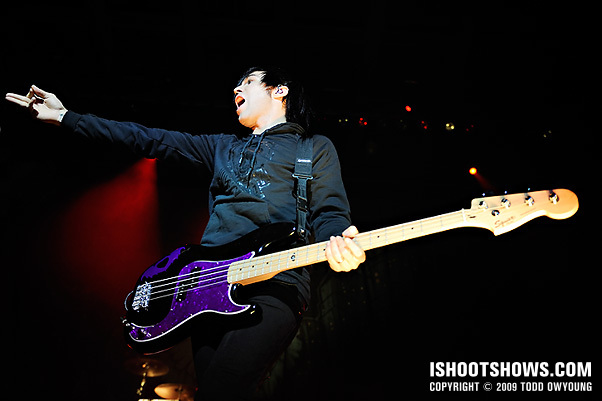 Todd, Its nice to see some professiall Fall Out Boy shots. I will be shooting them in the next couple of months, and a freind of mine got a gig doing their portraits. Luckily, hes going to let me assist to get some training on strobes and setups. Cant wait! Great set of pictures here! Hey Taylor, that sounds like a great opportunity if you get to assist your friend on that photo shoot. Pretty sweet gig, hope your live shoot goes well too. I’ll be reporting back after the Blink-182 gig as well. Very good set. Love the last one! wow. I love this shot. nice lighting!! i cant wait to shoot them on the 27th. can you give me your opinion on something real quick? can you tell me which one you think would be best for low light shows and/or shows in amphitheaters? Fenomenal photos! 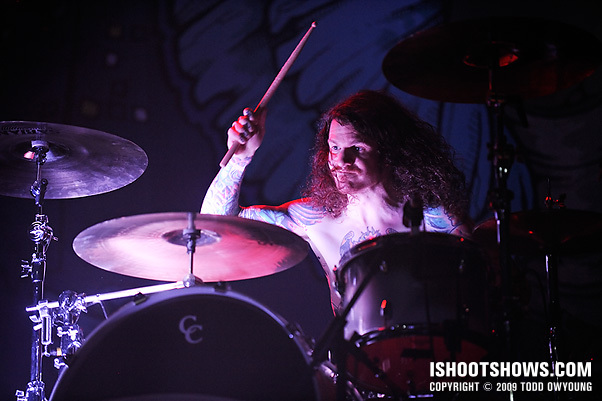 Love the drum shoot!